But with all those other things to be anxious or angry about, all the ills and inequalities of our society, is it really worth getting upset about losing the Boissiere House? I think it is. Because this is a line in the sand, a test of how mercenary and philistine we really have become. Contemporary Trinidad seems hell-bent on destroying everything we have that is beautiful and authentic, usually in the name of the dollar. We knock down gorgeous old buildings, erase their history and stories and memories, and build air-conditioned Miami-boxes. We pave our green open spaces. We drown true mas in floods of sequinned bikinis imported from China. The works of art in our National Museum are literally crumbling from neglect (when last did you go and look at them?). Most of our musicians can't get airplay (when last did you hear jointpop on the radio?). At some point will we say, enough is enough? Could this be that point? 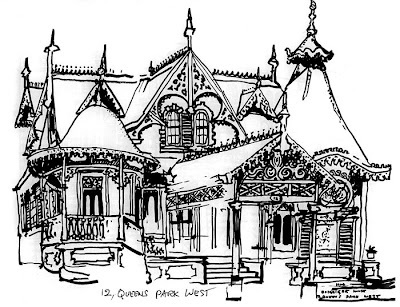 -- From my friend and colleague Nicholas Laughlin's missive on Boissiere House, the late-Victorian style "gingerbread house" at 12 Queen's Park West in Port of Spain. Boissiere House, over 100 years old, is one of our architectural treasures and in imminent danger of being torn down. If you'd like to help save Boissiere House and help protect our built heritage, do visit the Save Boissiere House website and sign the petition. But words won't save your life"
-- The Hold Steady, "Stuck Between Stations"
The Newsday's site is neat and clean, with the subsections easy to see and navigate. And they've got a nice feature with a gallery of the day's top news, lifestyle and sport photographs. So well done Newsday. As for the prize for the best site in terms of content... I'll have to get back to you on that. Two letter writers take up the same theme in today's Newsday. With the election bearing down on us, they both demand the same thing: a national debate between the leaders of the three main political parties. -- What do you think of the $10 minimum wage? Is it too high, or too low? Should we have a minimum wage at all? -- Are you for or against the death penalty? -- Should the descendents of slave owners be made to pay reparations to the descendents of slaves? -- Isn't it discriminatory to have equal opportunities legislation that denies the rights of gays? And isn't it time to repeal all anti-gay legislation? -- What with the number of women who die or are put at serious risk from so-called backstreet abortions every year, shouldn't there be abortion law reform? -- What is your view on the separation of religion and the state? Should the state continue to fund parochial schools/Should state-funded schools be religious? Just imagine what would happen if our political leaders were forced to answer questions like these, in front of the entire nation. Imagine what that could mean for our politics. But how will it happen? The politicians certainly aren't going to agree to it. We have to demand it. And the media have to do so on our behalf. As Ishmael Samad says in his letter, the ball is in their court. For a moment I imagined this constitutional foolishness becoming real, a grinning but concerned father monarch plastered everywhere, the politics of the absurd and violent magical reality, collateral damage, moral police, high food prices and inflation, ballroom dancing, enforced Christian learning in schools, "government" authorised Benny Hinn crusades, a museum to Eric Williams in the middle of the Savannah, two smelters, environmental degradation, mercantile monopolisation, gang warfare, miles upon miles of traffic; intellectual and artistic life crushed as the supremo deems artists and university professors as subversive, outsider, and illegal. A Christian State is declared with mass rallies, plenty singing and the live telecast exorcisms of demoniacal forces, anyone who is not a Christian is forced to wear a "heretic badge" and new laws of exclusion are passed to restrict the freedom of the press. Political dissenters are forced to work in government-run farms, a new Ministry of Social Order, headed by a congregation of appointed pastors is formed, with Inquisition like powers to hunt down the undesirable. Prohibition is introduced, and everyone gets a free TV from the government, the crime rate is magically and drastically reduced.